A native of France and a lifelong fantasy enthusiast who numbers Jack Vance, Fritz Leiber, and Michael Moorcock among his heroes, Pierre Grimbert has been awarded the Prix Ozone, for best French language fantasy novel, and the Prix Julia Verlanger, for best science fiction novel in any language. He is the author of thirteen much beloved novels of the Ji mythos, including the series the Secret of Ji, the Children of Ji, and the Guardians of Ji. He lives in northern France with his wife, Audrey Françaix (also writer), and four children. Find out more about the author at www.pierregrimbert.com. 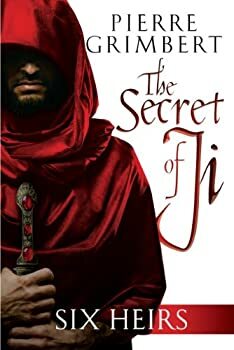 The Secret of Ji — (2013-2014) Publisher: The Known World is a sprawling region ruled by mortals, protected by gods, and plied by magicians and warriors, merchants and beggars, royals and scoundrels. Here, those with the gift of the Erjak share a psychic bond with animals; a far-reaching fraternity unites criminals of every persuasion in a vast army of villainy; and upon the mighty river Alt, the dead will one day sail seeking vengeance on the enemies of their descendants. But for all the Known World’s wonders, splendors, and terrors, what has endured most powerfully is the strange legacy of Ji. Emissaries from every nation — the grand Goranese Empire; desolate, frozen Arkary; cosmopolitan Lorelia; and beyond — followed an enigmatic summons into the unknown. Some never returned; others were never the same. Each successive generation has guarded the profound truth and held sacred the legendary event. But now, the very last of them — and the wisdom they possess — are threatened. The time has come to fight for ultimate enlightenment… or fall to infinite darkness. Six Heirs, the first book in the SECRET OF JI series by Pierre Grimbert, was originally published some years ago in the author’s native French. Sadly, it does not import well, though some of the flaws may be due to translation issues rather than authorial ones.